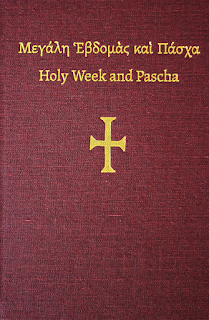 In terms of the physical appearance of the two books, the HTM's Holy Week and Pascha is slightly bulkier than Papadeas' Holy Week - Easter – about 1/3 thicker, 880 pages to Papadeas’ 500 – but same height and width. The paper quality in the HTM version seems better, and fonts and layout more attractive. For the English text, Papadeas has the benefit of slightly larger font, but when it comes to the Greek, the font used in HTM makes it easier to see and read despite being slightly smaller. The best argument for getting the HTM rather than Papadeas, and also the reason this is a bulkier volume, is that there is far more content. While Papadeas starts with the Matins of Holy Monday on Palm Sunday evening, HTM begins two days earlier with the Vespers, Compline, Matins and Liturgy for both Lazarus Saturday and Palm Sunday. 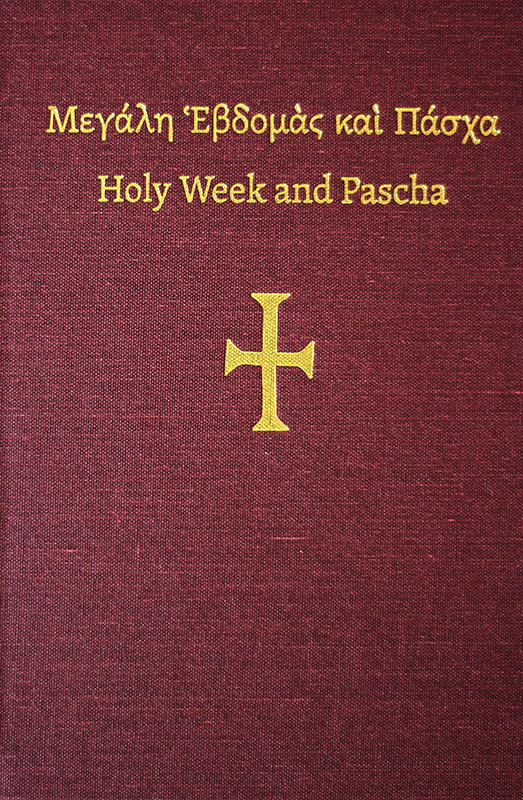 It also provides texts for Vespers for every day in Holy Week, while Papadeas only includes Vespers for Holy Friday, Saturday, Sunday, and the so-called “Agape Vespers” on the eve of Renewal Monday. What always disappointed me about Papadeas was that it includes no services for Holy Thursday at all, providing only the text of the Unction service on the basis that this tends to replace Holy Thursday Matins in most North American parishes. The HTM, however, includes both the service of Holy Unction, and the Matins and Vespers of Holy Thursday. HTM also includes the full set of Biblical readings for the various services: for the Vesperal Liturgy on Holy Saturday Morning, Papadeas has three readings from the Old Testament, while the HTM has the full fifteen. Another benefit of the HTM version is that the English translation of Biblical material actually corresponds to the Greek text on the adjacent page, while the readings in Papadeas follow the Hebrew MT even where it differs significantly from the Greek Septuagint. Compare, for example, in Papadeas the Greek and English reading from Job in the Vespers of the Apokathelosis: the English ends with Job dying “an old man and full of days”, while the Greek continues with another 5 verses showing Job’s genealogical connection to the Patriarch Abraham. I haven’t yet had time to look closely at the HTM translation of the hymns to see how it compares to Papadeas linguistically and in terms of accuracy, although I can imagine you will find some of the awkward wording HTM are occasionally criticised for. 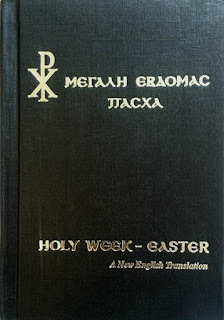 As with many of their other liturgical books, the HTM translation of the Lamentations sung during the Matins of Holy Saturday is designed to fit the Byzantine melodies – and fit it does, hand in glove – which means various adjectives not found in the original text are added to make up for the lack of syllables. At least when it comes to the much-loved Lamentations, where it is not uncommon for the congregation to join in, this is a plus in my opinion. All things considered, (if it is the Lord’s will and we live) I will most definitely be taking the HTM version with me to church next time Holy Week comes around. However, if I was recommending or buying copies to distribute to parishioners, I would probably still have to go with Papadeas, because it is a book designed to follow along with: 1) Papadeas tries to provide the entire text of each service, from the first “Blessed” to the final “Amen”. Nothing is abbreviated. While the service of Matins for each day is relatively complete in the HTM version, some familiarity with the structure of services is still assumed: things such as the Great Litany, the ‘dialogue’ between the priest and choir before Scripture readings, the Trisagion prayers, etc. are omitted or abbreviated, and there is some cross-referencing to avoid repetition. I can therefore see people getting lost if trying to follow along. 2) Papadeas provides detailed rubrics, such as “This Psalm is chanted in a monotone, while the priest censes…with the…small hand-censer”, where HTM has none. Granted, some of these rubrics are wrong and even inappropriate (telling the congregation to sit during the reading of the Hexapsalm, for example, while the HTM instead stresses the need for them to “listen in all silence and with compunction”), but these are relatively few. The big exception is the prayer of St. Ephrem the Syrian, where Papadeas says nothing about prostrations (the Greek is not even broken up into three lines, suggesting it should be read straight through), when in fact it is the prayer which is there to accompany the prostrations, not the other way around. 3) Generally speaking, Papadeas presents the services as they are commonly done in parishes, while HTM presents the services as they should be done. I am happy HTM has all fifteen OT readings for the Vespers on Holy Saturday morning, but if most people using the book are only ever going to hear three read in church, this is going to cause confusion. With Papadeas, what the reader sees on the page is what s/he is likely to see in church. 4) I am personally quite fond of “traditional English” in liturgical texts, particularly because it retains the second person singular pronouns, but it can take some getting used to, and if Holy Week is the only time of year you hold a liturgical book in your hands (as is the case with many), it might be needlessly difficult or off-putting. To conclude, Papadeas has certainly been surpassed by HTM’s new volume, but not necessarily superseded. I am a priest of the Greek Orthodox Archdiocese of Thyateira and Great Britain. Anything posted on this blog are purely my own personal thoughts (unless otherwise indicated) on issues pertaining to the Orthodox Christian faith.